While you’re growing your garden, you may decide you want to empty a pot to plan some different flowers. There are a couple of ways to do that. You could simply cut all the flowers, one by one, into your bouquet. When you cut the last one, the pot will be empty and ready to be planted again. This will only work if the flowers don’t have the regrowing property. You can also do it all at once by tapping on a flower and you’ll get an action menu with three options. 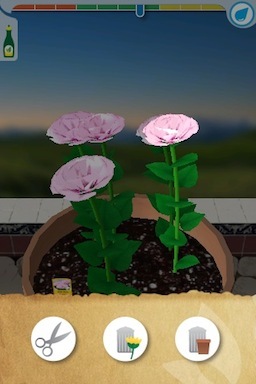 Select the rightmost option (a pot and a trash can) and it will cut all the flowers and leave the pot empty.